Chatbot Market size was estimated to be over USD 250 million in 2017 and is anticipated to grow at a CAGR of over 31% from 2018 to 2024. Chatbot market is driven by the rapid proliferation of messaging platforms. The messaging applications that mainly include Facebook Messenger, WeChat, and Slack have in-built chatbots that are the popular hubs for e-commerce businesses and consumer interactions. In 2015, these applications had approximately 2.1 billion active users worldwide, surpassing the social media usage number. Furthermore, the technological developments in the fields of AI, NLP, inference engine, mobile platform compatibility, cloud-based deployment, multilingual, and single search point are anticipated to fuel the market growth. The acceptance of chatbots in the e-commerce sector has increased rapidly, accelerating the market growth. Chatbots are programmed in a way to provide a personalized experience to the customers by engaging in two-way real-time communication, solving customers queries, and navigating them through their desired product range, optimizing customer satisfaction. Due to the increasing competition, businesses also leverage chatbots to improve their marketing and sales strategies by interacting with their customers on a regular basis, thus receiving a higher customer retention rate. For instance, Personetics, a finance firm claims that chatbots handle 95 percent of their customer queries, increasing the online engagement and cross-selling. The lack of awareness about the benefits of chatbots amongst businesses, security issues concerned with chatbots, and lack of support for B2B businesses are the factors anticipated to restrain the market growth over the forecast period. Chatbots work in two ways: rule-based and machine learning-based. In 2017, the rule-based chatbots owned around 85% of the market but their acceptance rate is anticipated to reduce over the forecast timeline. The rule-based chatbots are economical to build and are capable of handling basic customer queries, thus being the most popular chatbots in the market. However, they are unable to understand the context or intent, limiting their use for multiple functions. The AI-based chatbots are growing at a CAGR of 53% as they have artificial neural networks stimulated by human brain programmed in a way that they self-learn on the introduction to new texts or voice. These chatbots receive their capabilities from AI and adjust their conduct based on customer interactions, which accelerate their demand in the market. The standalone interface dominates the chatbot market and is projected to hold the majority of the share over the forecast timeline with a CAGR of 29%. 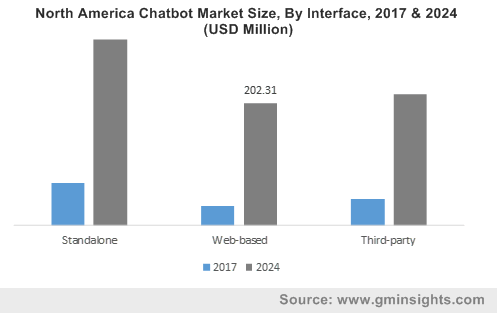 The ease of installation and usage along with built-in graphical interface and audio components including speech recognition are the major factors accelerating the standalone interface growth in the chatbots market. The web-based interface is growing at a fast pace due to the benefits they offer such as tailored user experience, extensive customer support, and reaching huge target customer base through messaging platforms such as Telegram, Slack, Facebook, and Skype. They also enhance the efficiency of the businesses by saving customer query handling time and fueling the market growth. The customer service segment accounts for the highest share of 42.82% in the market due to the rising need for enhancing the customer services to retain the existing customers and attracting the potential customers. The advancements in the field of AI are anticipated to create chatbots capable of developing an emotional rapport with humans and enhancing the customer service. For instance, Microsoft developed a new bot framework named “conversations as a platform’’, which consists of developer tools to make bots understand human voice and use AI to answer queries and deliver important information. Chatbots also provide a personalized experience to their customers increasing their usage in various industries such as e-commerce, educational, healthcare, and BFSI. For instance, the banking industry spends approximately USD 150 million every year on customer service. The social media platform is booming in the chatbot market as various businesses use this platform to increase the engagement and the visibility of their brands. The chatbots assist in automating customer service on these platforms, benefiting both the small businesses and large organizations, which will augment their market growth. The on-premise chatbot deployment model dominates the market as it assists the businesses in gaining better data control and security. It handles all types of confidential business data including customer contact details, employee’s social security number, supply chain management and logistics to drive its demand in the market. The cloud-based deployment model is anticipated to grow at a CAGR of 51% over the forecast timespan. The rapid increase in the cloud-platform providers, such as IBM Watson, Chatfuel, and Microsoft Azure, are further propelling its demand in the market. E-commerce sector accounts for around 35% share in the chatbot market and is anticipated to grow at a CAGR of over 34% over the forecast period. Due to the rapid development and growth of AI, the chatbots are anticipated to get more sophisticated with time, increasing their acceptance in the e-commerce sector. They provide various benefits such as reduced customer waiting time, 24/7 availability, better interaction with customers, reduced expenses, online store management capability, and personalized shopping experience, thereby improving the market. The BFSI segment is growing at a fast pace as the chatbots act like a personal finance assistant helping the customers at each stage of banking. Chatbots also provide expertise in fetching analytics, fraud detection, and data capture to boost their market demand. They provide information to the customers regarding various offerings of the bank in terms of promotional schemes and additional services, making their usage beneficial for the banking and finance sector. North America held around 57% of share in the global chatbot market. Chatbots have gained importance in numerous applications such as e-commerce-based internet gaming, customer service, and call centers. Various technological advancements, such as IoT, AI, and APIs, are growing at a rapid rate. Chatbots are integrated along with these technologies offering improved operations. Moreover, the changing business dynamics, 24/7 customer service availability, cost efficiency, and client-centric approaches are the factors accelerating the market growth. The U.S. dominates the market in North America and Canada and it is anticipated to grow at the fastest rate over the forecast period. Asia Pacific is one of the fastest growing regions in the market. The demand is chiefly attributed to the growing ICT infrastructure in the expanding economies of China and India. In 2018, China’s smartphone user base has exceeded 700 million users and around 70% of those people use WeChat. China brought about an instrumental change in the adoption rate with the introduction of chatbot platform in WeChat application. Furthermore, the increasing population of mobile phone users forms a promising consumer base for the market in this region. 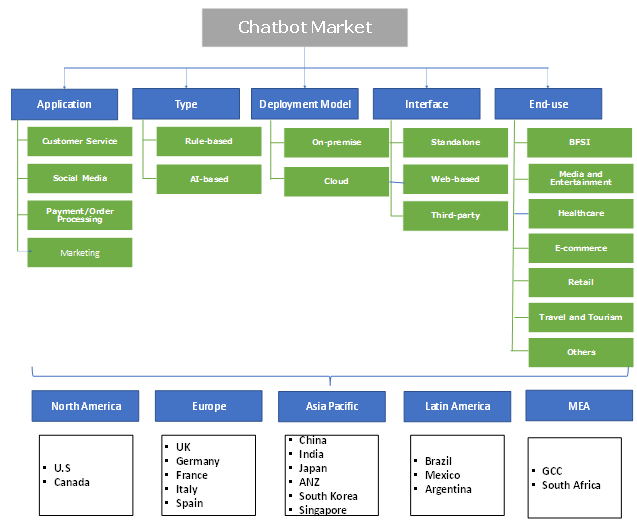 The chatbot market is characterized by the presence of both multinational and domestic players. Companies operating in the market are investing huge funds into R&D strategies aimed at bringing about technological advancements in the chatbot industry. For instance, in November 2017, Sinovation Ventures, a Chinese venture firm invested USD 20.6 million in Zhuiyi Technology, an AI startup firm developing chatbots. The company aims to use this investment in carrying about R&D on their products to drive the market growth. Some of the key players operating in the chatbots market are Baidu, Babylon Health, Google, Microsoft, Kik, Poncho, ReplyYes, LivePerson, Slack Technologies, and WeChat. The introduction of chatbot has opened new boundaries into the business world in terms of customer engagement and ease of interaction. Chatbot helps businesses across all industries, saving around USD 6 billion per year and around 34% of employees use this free time in increasing their work productivity. Presently, the chatbots are mainly seen on websites and other social media platforms to assist customers in solving their queries. Although the adoption of chatbots is in the early phase, a lot of development is expected in this field soon with the advancements in AI offering improved language processing capabilities and rapid personalization. How is chatbot market growth changing the customer service & relationship dynamics?